We've updated the classic tuna noodle casserole with the addition of VELVEETA. 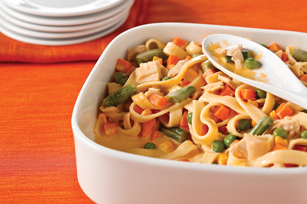 This tuna noodle casserole is comfort food at its best. Cook noodles in large saucepan as directed on package, omitting the salt and adding vegetables to the boiling water in the last minute. Drain; return to pan. Stir in Velveeta, tuna and milk. Spoon into 1.5-L casserole; cover. Bake 15 to 20 min. or until heated through. Stir before serving. Prepare as directed, substituting elbow macaroni for the noodles and 2 cups finely chopped cooked chicken for the tuna. Substitute your favourite medium-size pasta for the egg noodles.